Do you like hot dogs? 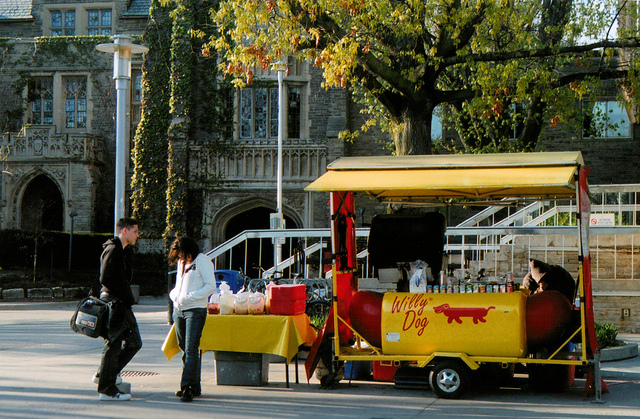 With more than 45 percent of the 5,000 votes cast in our recent poll, it’s apparent that Hamilton, Ontario loves the Willy Dog Hot Dog Cart! We are proud to announce that they are Mobile Cuisine’s 2014 HOT DOG VENDOR OF THE YEAR. We are happy to celebrate this great news with Jim Bontaine, the owner of the Willy Dog Cart. He’s made McMaster University his year-round home rain or shine and the students deserve a huge shout out! They overwhelmingly supported Bontaine and his hot dog creations. 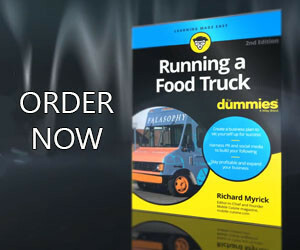 That’s the type of news that keeps us interested in the mobile food community. The community! To accommodate his diverse student clientele, he’s created over 30 toppings for his dogs. There’s something for everyone from every corner of the globe to cover your veggie, beef or halal chicken dog. As the Spring term starts, we wonder what the future holds for this McMaster University institution. Will we see more colorful carts around town? Will there be over 40 toppings by Fall term? Whatever comes next, we can’t wait! All we know is that Bontaine and Willy Dogs will be there to serve the best hot dog dishes! Based on Willy Dog lovers, we think a road trip is in order to try as many of those creative toppings on every dog. We heard there would be a riot if he ran out of barbeque chips! Hmmm… I’ll leave my pitchfork at home and bring extra napkins with my appetite. We’ll take a deeper look into Willy Dog in a feature article later this week.